There are so many ways businesses segment customers, and many of them are useless: demographics, location, purchasing histories, size of company, how much the customer pays, and so many more. But there’s one method of segmentation that tends to be overlooked. And overlooking it will lead, invariably, to churn. It’s called Appropriate Experience (AX). And I guarantee it’s not what you think. Appropriate Experience is an extremely customer-centric idea, because it’s all about them. The customers. Their experience. But this isn’t “customer experience.” Forget CX and customer satisfaction. No, no. This is completely different. Appropriate Experience is about how the customer needs to be treated and supported by you so they can reach their desired outcome. But what is it really – in practice? 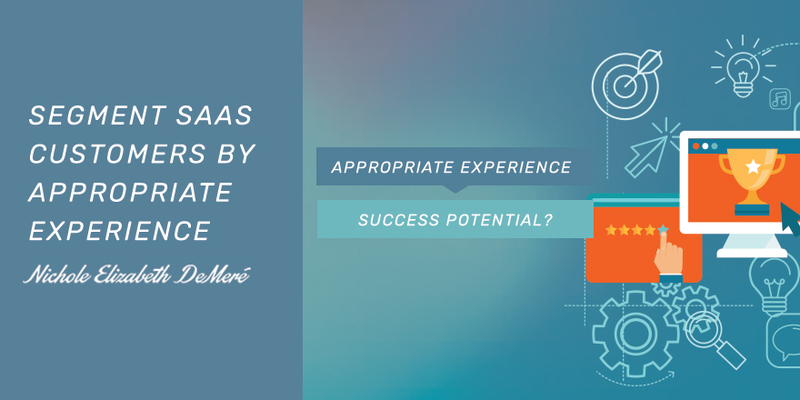 For SaaS, a good example of Appropriate Experience might be customers who need high-touch customer support vs. low-touch. Maybe the customer’s Appropriate Experience is self-service, because they have the expertise and technical abilities to figure out most things for themselves. Or maybe the customer’s Appropriate Experience requires some hand-holding, a designated customer-success manager and 24-7 help desk. You see, a customer has a required outcome. A thing that they need to achieve… And they have a way that they need to achieve that Appropriate Experience. That Appropriate Experience – AX as I call it – goes across the entire customer lifecycle. In many ways, Appropriate Experience (aka. Experience fit) is the flip-side of Resource fit. Resource fit asks the customer if they can spare the resources to put in the time/money/manpower to succeed with the product. Experience fit asks you – the SaaS company – the same question. Do you have the resources to ensure that this customer has the experience they need to reach their ideal outcome? What experience are you able and willing to provide? You may not have the resources to serve customers who need the high-touch approach. And that means that you can’t give that particular customer segment their Appropriate Experience, and they won’t be successful with you. You can’t afford not to identify your customer segments by the experience they require. Yes, that also means you can’t afford to keep customer segments to whom you can’t deliver an Appropriate Experience. Even if they’re paying you. It sounds crazy to turn away good money, I know. But these are people who will never be satisfied with what you offer. They won’t refer you business. They’re highly likely to leave lackluster reviews. And they will churn – after wasting a tremendous amount of your time and resources trying to make them happy when that was never gonna happen. When you use Appropriate Experience as a factor in customer segmentation, you may find that a large part of your customers demand a type of experience you’re not currently providing. You might consider expanding your services and scaling to meet that need. If this is a possibility, you’ll want to first survey that segment and ask them what experience would most help them achieve their desired outcomes. But when you do, keep Lincoln Murphy’s checklist in mind. Are these customers who have success potential, if only they had a slightly different experience? Also keep in mind that Appropriate Experience isn’t limited to how much help a customer gets. It’s not just a high-touch/low-touch issue. If my desired outcome is to go out to dinner with my significant other for a romantic evening, there is a very specific experience I need to achieve that, and Burger King isn’t going to do the job. Think holistically. Another option, of course, is to not scale or change the experience you provide. You could decide to focus on the customer segment whose Appropriate Experience matches what you’re prepared to offer. Both are actually good options. The only bad option is accepting the business of someone you can’t really serve.